‘Tis the season for wokking! About two weeks ago my friend Kathy Gunst did a radio segment for WBUR’s Here and Now: The 4 Kitchen Gadgets That Should Be On Every Chef’s Holiday Wish List. Kathy asked me to weigh in on my favorite kitchen tool. 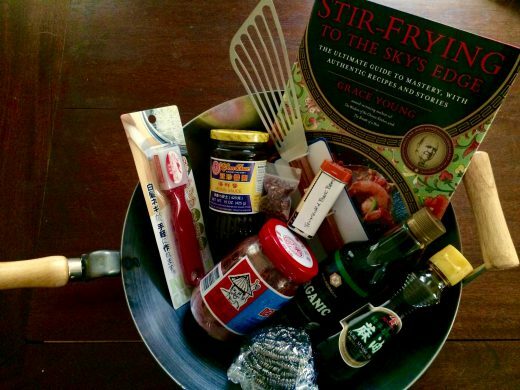 Well, how could the wok evangelist resist plugging her favorite pan? Tane Chan of WokShop.com tells me that since the segment aired, her staff has been busy packing up woks nonstop! Cartons clutter the entrance of Tane’s tiny store in San Francisco’s Chinatown, with more boxes in the back and in every corner waiting for the daily UPS and FedEx pickups. 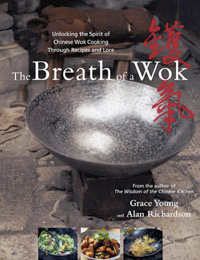 The Wok Shop is always super-busy at this time of year because woks are perennially popular holiday gifts. But Kathy’s segment fed the wok-buying frenzy. Tane says she can tell when it’s an order from a “Here and Now” listener because, “They only order the wok. No accessories, no questions, nothing—just a wok!!! 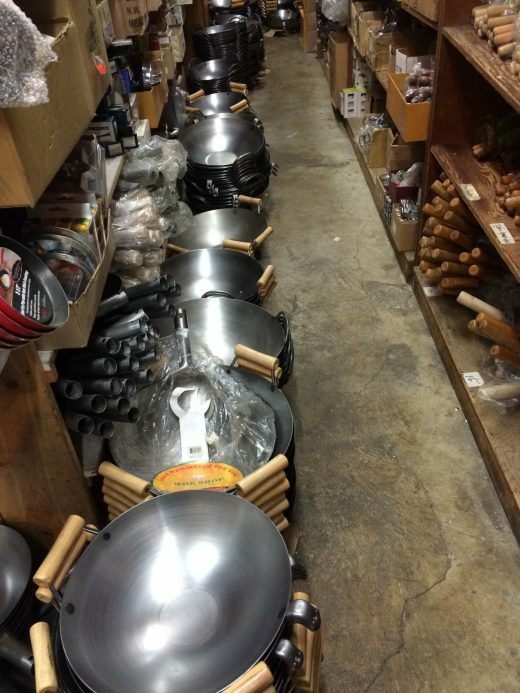 And it’s gotta be the one Grace Young recommended—the 14-inch flat-bottomed carbon-steel wok with the long wooden handle!” Here’s a peek at the Wok Shop’s storage room (which is quickly emptying out). Heartfelt thanks to Kathy Gunst and the folks at “Here and Now.” It sure gives me a smile to know that lots of woks will get homes this year. And that a small business like the Wok Shop is getting a holiday booster shot (take that, Amazon!). 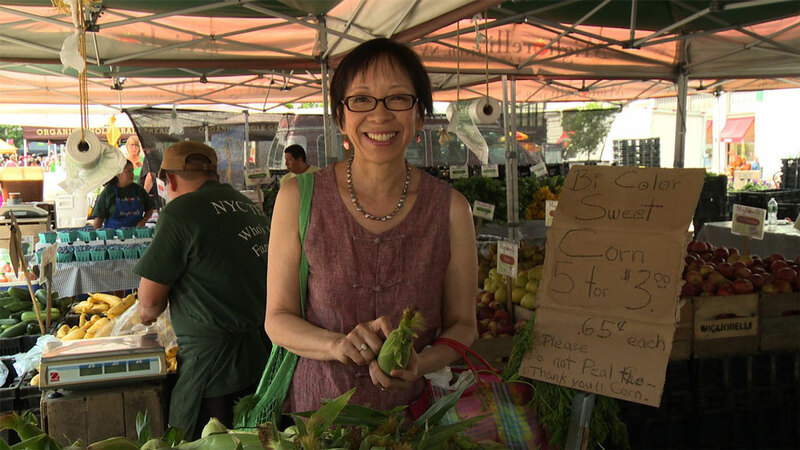 Tane Chan has been running the Wok Shop for over 47 years. It’s an amazing store with so much heart and soul put into taking the best care of every customer. And the carbon-steel wok that Tane sells is an incredible bargain: For just $25 you get an American-made wok that’s built to last a lifetime. So stop looking high and low for the most inspired and practical gift for your friends and colleagues who cook. When you give a wok you’re bestowing a culinary tool with a 2000-year legacy. And don’t just think of it as a stir-fry pan when it’s so much more. 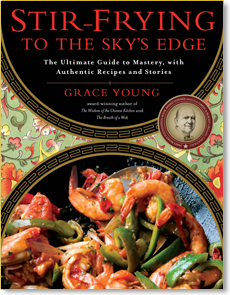 As the legendary Chinese cooking expert Florence Lin wrote, “With one wok you can do everything.” I use mine to scramble eggs, pan-fry steak, steam fish, boil dumplings, poach chicken, braise red-cooked pork, deep-fat-fry spring rolls, and smoke chicken—and it makes the best popcorn you’ll ever taste! But don’t forget to round out your present with a few holiday trimmings. Here are a few of my favorites: a flexible metal spatula (critical for getting under meat, rice, and noodles to prevent sticking—a wooden is too thick); some essential staples like hoisin, chili bean sauce, organic soy sauce, Asian sesame oil; a little jar of Sichuan peppercorns or fermented black beans; a stainless-steel scrubber for seasoning the wok; a negi cutter for making fine scallion shreds; and last but not least, what my friend Rob Baas calls “the wok manual”: a copy of Stir-Frying to the Sky’s Edge. This holiday season give a gift every cook will love. Happy Holidays! 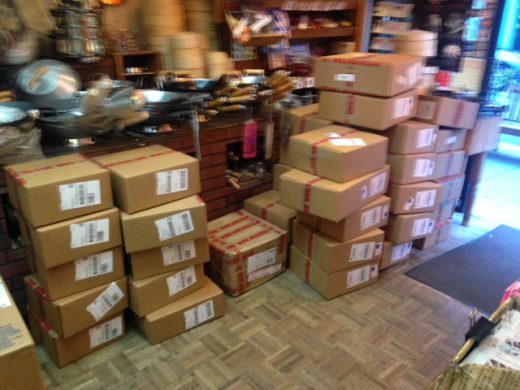 Love the picture of all the boxes in the store!! Best gift one can recieve!! 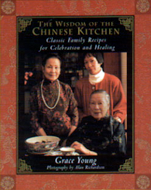 Can’t go wrong with gifting a wok, one of Grace’s books, and a few goodies – a lifetime of delicious meals to follow! Cathy, I love the photo too. So glad it’s a merry holiday season for Tane Chan. I agree. Woks make the best gifts! Thanks to you, I have one of Mme. Chan’s 14 inch flat bottom carbon steel woks; I ordered it about 6 months ago, and prepared it just as instructed by you and Mme. Chan. I love my wok! It is a beautiful wok. Cherish it for the rest of your life! i would guess you’ll never find one like it again.